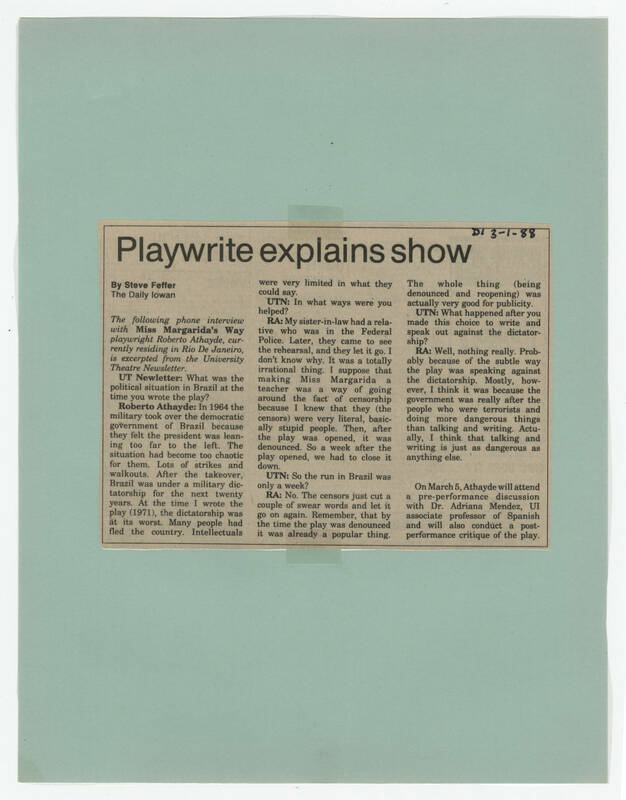 [[Handwriting]] DI 3-1-88 [[Header]] Playwrite explains show [[end header]] [[bold]] By Steve Feffer [[end bold]] The Daily Iowan [[Article Text]] [[Italics]]The following phone interview with [[end italics]] [[bold]]Miss Margarida's Way [[end bold]] [[italics]] playwright Roberto Athayde, currently residing in Rio De Janeiro, is excerpted from the University Theatre Newsletter. [[end italics]] [[bold]]UT Newsletter:[[end bold]] What was the political situation in Brazil at the time you wrote the play? [[Bold]]Roberto Athayde:[[end bold]] In 1964 the military took over the democratic government of Brazil because they felt the president was leaning too far to the left. The situation had become too chaotic for them. Lots of strikes and walkouts. After the takeover, Brazil was under a military dictatorship for the next twenty years. AT the time I wrote the play (1971), the dictatorship was as its worst. Many people had fled the country. Intellectuals were very limited in what they could say. [[Bold]]UTN:[[end bold]] In what ways were you helped? [[Bold]]RA:[[end bold]] My sister-in-law had a relative who was in the Federal Police. Later they came to see the rehearsal, and they let it go. I don't know why. It was a totally irrational thing. I suppose that making Miss Margarida a teacher was a way of going around the fact of censorship because I knew that they (the censors) were very literal, basically stupid people. Then, after the play was opened, it was denounced. So a week after the play opened, we had to close it down. [[Bold]]UTN:[[end bold]] So the run in Brazil was only a week? [[Bold]]RA:[[end bold]] No. The censors just cut a couple of swear words and let it go on again. Remember, that by the time the play was denounced it was already a popular thing. The whole thing (being denounced and reopening) was actually very good for publicity. [[Bold]]UTN:[[end bold]] What happened after you made this choice to write and speak out against the dictatorship? [[Bold]]RA:[[end bold]] Well, nothing really. Probably because of the subtle way the play was speaking against the dictatorship. Mostly, however, I think it was because the government was really after the people who were terrorists and doing more dangerous things than talking and writing. Actually, I think that talking and writing is just as dangerous as anything else. On March 5, Athayde will attend a pre-performance discussion with Dr. Adriana Mendez, UI associate professor of Spanish and will also conduct a post-performance critique of the play.